Recently I’ve been wanting to create some new, weird vehicles. 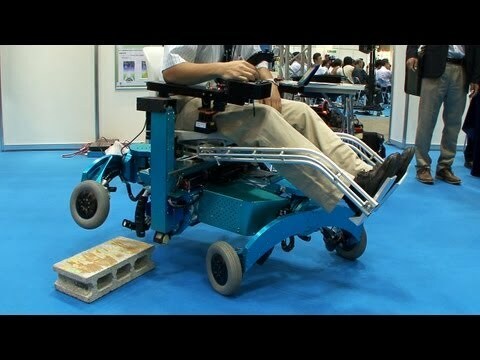 In the course of gathering information toward the goal, it somehow led me to this super wheelchair. I think this is phenomenal. The great part lies specially in the design concept that the user shall simply operate the joystick and the machine does all the rest based on the current situation, as well as in the engineering capability to materialize it. Some people criticize it for the “rocking movement that real disabled people couldn’t stand,” which simply cannot be more wrong. Of course there still are issues left to be solved at this stage. But there already are so many people out there that can extend their freedom by quite a few degrees with the technology already presented in this prototype phase product. Also, there are users who need wheelchairs but do not have any problem with this much vibration. Besides, I bet shock absorption is, by several huge notches, easier than the already implemented controls in terms of technological difficulty. I love making something new and getting drowned in thoughts in the process. Then sometimes (actually very often), I encounter great inventions that I have to admit I just couldn’t conceive. And it makes me look forward to seeing those things, which may be equivalent to 10 or 20 Christmas times, come out available like the greatest Christmas present you’ve ever woken up to.